Laparoscopic and robotic liver and pancreatic surgery is a new and emerging field. Surgeons need not only extensive experience in traditional operations on the liver and pancreas, but also separate laparoscopic and robotic training and experience. 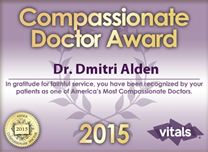 Dr. Dmitri Alden has extensive training and experience in laparoscopic and robotic liver and pancreatic surgery. In addition to an office based consultation, the NYC liver cancer & pancreatic cancer surgeon offers remote consultations to patients and medical professionals anywhere in the world via phone or SKYPE. Please follow this link to learn more: remote consultations. Laparoscopic and robotic surgery procedures are extremely challenging technically and require major physical effort, concentration, and mental capabilities to be completed safely. The reward is quick healing and recovery, a short hospital stay, faster access to additional necessary treatment, and an excellent cosmetic outcome. Such operations leave virtually no scars on the abdomen. Critics state that scars are irrelevant to the patient being treated for a major cancer. Our Surgeons think otherwise. We take psychological aspects of surgery very seriously. Good cosmetic results might not be the primary concern of our patients, but they are extremely important to many. The absence of large disfiguring scars improves not only the patient’s physical condition and performance status, but also their mental well-being and overall quality of life, which many patients are concerned about. Current developments in surgical techniques, instrumentation, and technology have made minimally invasive surgical procedures possible on the liver, bile ducts, and pancreas. These procedures, while rarely offered worldwide, are routinely performed with great success in our center at Lenox Hill Hospital. When minimally invasive surgery techniques were being developed, one major goal was to be able to perform the operations using small incisions without any compromise in the quality and outcome. Surgeons worked hard with engineers and the medical industry to develop tools adapted to the minimally invasive surgical procedures. The first result was laparoscopy, which has been adopted worldwide and is a standard for many surgical procedures today. 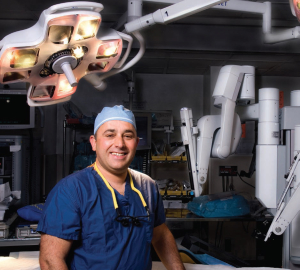 The next step was creation of the da Vinci robotic system, considered by many a modern marvel of surgical innovation. These systems and instruments allow qualified and skilled surgeons to perform complex procedures, leaving virtually no scars. Laparoscopy is a technique in which operations in the abdomen are performed through small incisions (usually 0.5-1.5 cm) as opposed to the larger incisions used in regular surgery. Several tiny incisions are made in the abdomen and a tiny camera and ports with surgical instruments are introduced through the incisions into the abdominal cavity. Additionally, carbon dioxide gas is pumped into the abdomen (essentially blowing up the abdomen like a balloon) to create working space. During laparoscopy, the surgeon and his or her assistants move the instruments to make necessary changes inside the body to treat the problem, using the images on the camera to see what is going on inside the body. The challenges of this technique involve extreme eye-hand coordination. 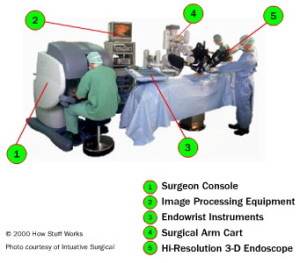 This system also relies heavily on the surgeon’s ability to translate the 2-dimensional picture of the surgical field on the TV/monitor screen into the 3-dimensional space of the actually surgery. The creation of the robotic system has allowed surgeons to overcome some of the challenges posed by laparoscopy. The surgery normally starts like a typical laparoscopic procedure, but once the camera and the ports are inserted into the abdomen, the robot is “docked” to the patient. This is done by attaching robotic arms with instruments to the ports inserted into the patient. 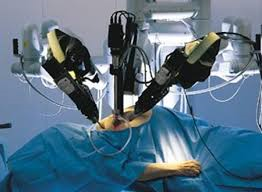 Then the surgeon sits at a separate console and moves the robotic arms by manipulating controls at the console. The da Vinci robotic system addresses many difficulties and frustrations commonly found in laparoscopy, such as the inability to bend the instruments. The robotic instruments have true 360-degree rotation, allowing easier tissue manipulation and much faster and more secure suturing. The da Vinci system also uses a camera scope that has 2 cameras inside, creating a near 3-dimensional view for the surgeon at the console. This improves the surgeon’s depth perception so he or she can see inside the abdomen better, which increases the patient’s safety. Am I a Candidate for Laparoscopic or Robotic Liver or Pancreatic Surgery? Many of today’s common liver and pancreas procedures can be performed in our center using laparoscopic or robotic techniques. In fact, the vast majority of our surgeries are done using the minimally invasive approach. Chances are, even if you were told elsewhere that minimally invasive surgery is not possible, we still might be able to offer you this option because of our extensive experience in the field. Unfortunately, not everyone can be operated this way. The decision is based on many factors, and the entire decision-making process cannot be presented in a short article. Aspects of a case that would play a major role in deciding whether a patient is a candidate for laparoscopic or robotic surgery include the size of the tumor (or tumors), its location, its nearness to large blood vessels, and the patient’s general medical condition and the ability to tolerate the abdomen being expanded with air for a prolonged period of time. Please contact our NYC office for a detailed evaluation of your case. For more information pertaining to Laparoscopic and Robotic Surgery or to schedule a consultation with the Laparoscopic and Robotic Cancer Surgeon, please feel free to contact the NYC Liver, Pancreatic & Bile Duct Oncological Surgeon, Dmitri Alden, MD, FACS, today by phoning his New York office (212) 434-6216 or emailing the surgeon using the eForm on the right.